Bayern Munich didn’t try to outpass Barcelona, and instead ruthlessly exposed their traditional weaknesses. Jupp Heynckes selected Mario Gomez rather than Claudio Pizarro as Mario Mandzukic’s replacement, and decided Jerome Boateng was a better option than Daniel van Buyten because of his extra speed. Tito Vilanova’s side was as expected: Lionel Messi was fit, and Alexis Sanchez started as wide forward on the left, with Pedro Rodriguez on the right. Barcelona enjoyed a decent opening ten minutes, but Bayern were strategically perfect and fully deserved to win by such a convincing scoreline. Pressing was always likely to be important in deciding the shape of this game, and Bayern’s pressing strategy worked well. They used an approach that has becoming increasingly popular in top-level games over the past year: they pressed the opposition at goal-kicks, preventing them from playing the ball forward into midfield easily…but once that press had been passed through, Bayern dropped deep into a solid defensive shape, and from then rarely pressed the Barcelona defenders. Barcelona conceded possession cheaply inside their own half – but not always when under heavy pressure. The spell of pressure that eventually resulted in Bayern’s opener started from two Barcelona mistakes – Marc Bartra misplaced a pass which resulted in an unnecessary corner being conceded, then as soon as Barcelona had cleared the danger, Busquets lost the ball in a similarly dangerous position. Barcelona actually pressed higher than Bayern in the opening stages, despite Lionel Messi appearing unfit and unable to lead the pressure as effectively as usual. But pressing high isn’t always useful if not backed up by the midfield, and Bayern could often pass their way out of trouble – particular credit should go to Boateng, who played a couple of excellent vertical passes to bypass the half-hearted pressure. Bayern were admirably disciplined without the ball, especially considering the anticipated problems with Mandzukic’s absence – he’d been brilliant in a defensive sense against both Arsenal and Juventus. Gomez and Thomas Muller dropped deep and one always occupied Sergio Busquets, preventing him from starting attacks. Barcelona’s two centre-backs and the other two central midfielders were all given more time on the ball than Busquets. The other two attackers, Arjen Robben and Franck Ribery, were extremely disciplined in tracking Barcelona’s full-backs. Ribery was pushed back by Daniel Alves’ forward bursts and had a couple of nervous moments, but overall Bayern were compact and their two banks of four moved across the pitch together seamlessly. Messi only found space between the lines a couple of times, and instead had to venture out to the right flank to collect the ball. Javi Martinez pressured Andres Iniesta, while Bastian Schweinsteiger – despite being outfoxed by Xavi Hernandez a couple of times in the opening minutes – continued to shut down energetically. Barcelona’s midfielders all played deeper than they would have liked – Busquets dropped into the back to get space, Xavi roamed around in front of his own defence rather than getting involved in a proper midfield battle, while Iniesta spent too much time doing the job of Xavi, and not enough time linking midfield with attack. They showed some intelligence to vary their positioning and find space, but ultimately their passes were always in front of Bayern, never looking to penetrate. The game’s key player was Martinez, whose specific task was to stop Iniesta (something he did effectively) but who was more generally used as a powerful destroyer in the centre of the pitch. While a reliable distributor of the ball, Martinez played almost solely a physical role here – no fewer than 20 players attempted more passes than him, but no-one completed more tackles, and he committed twice as many fouls as anyone else. He was also a presence at attacking transitions, charging forward suddenly to support attacks, as he’d done in the 3-1 victory away at Arsenal. It was that sheer energy and physicality that typified Bayern tonight, and while Martinez rightly remains a less celebrated player than Xavi, Iniesta and Busquets, arguably none of them could have played this all-round role. Martinez physically unsettled Iniesta, and shortly after he’d fouled Barcelona’s playmaker in the first half, it was interesting to see Busquets step forward into a challenge with Martinez, as if he understood his presence was needed higher up. (Busquets has praised Martinez’s physical abilities in the past – “Javi Martínez has a spectacular physical potential. He gets all around the pitch and wins possession back everywhere. He’s the lungs of the team.”) Iniesta’s last action of the night, meanwhile, was cynically fouling Martinez after getting caught out of position. It was in this respect that Barcelona missed Seydou Keita, one of the underrated squad members under Guardiola. He brought energy and power to the midfield zone, and while he wasn’t always a regular, he started the away leg of the semi-final in 2009, 2010 and 2011. Alex Song, signed as Keita’s replacement, isn’t considered up to the job. Barcelona had a considerable height disadvantage at corners, and this proved to be fatal. Gerard Pique is good in the air, while Busquets and Bartra are capable, but Barcelona’s problem in this respect was obvious against PSG in the previous round, and was even more problematic with Martinez, Dante, Gomez and Muller all forward for corners. Barcelona could have helped themselves by not allowing Bayern 11 corners (some of them conceded very cheaply), and Bayern’s first two goals came from similar moves following dead ball situations – a header back across goal, rather than a direct attempt – for the goalscorer to convert. Even Bayern’s set-piece dominance involved cohesion and teamwork. As it happens, Barca’s best chances were from set-pieces too – Bartra had two attempts, as many as the rest of the side combined. Barcelona increasingly pushed men forward in the second half, and were inevitably undone on the break. The one thing Bayern didn’t do effectively in the first half was dribble – 12 of their 14 take-ons were unsuccessful – but having spent so long being disciplined, Ribery and Robben could now storm forward at speed. For the third goal, Pique went haring forward to become an additional centre-forward, leaving the defence exposed, and at the attacking transition Bayern went the length of the pitch with a counter-attack reminiscent of Bayern’s 2009/10 season (and, specifically, Robben’s debut against Wolfsburg when he and Ribery constantly combined on the break). A Ribery dribble also played a part in Muller’s fourth. Vilanova seemed uncertain of his Plan B – Pedro and Sanchez swapped wings, but only in the 83rd minute, at 4-0 down, did Vilanova turn to the bench – David Villa replaced Pedro. Heynckes made a logical change at 2-0, introducing holding midfielder Luiz Gustavo for Gomez to bring extra energy and defensive strength to the midfield. Muller went upfront and Schweinsteiger played a little higher, from where he influenced the game much more in an attacking sense in the final 20 minutes, as Bayern continued to test Victor Valdes. For all the talk of Barcelona influencing Bayern in terms of possession play, and Bayern’s supposed willingness to take on Barca at their own game, this was nothing of the sort. It was a fine technical display from Bayern, but was primarily based around the (only?) three tactical weaknesses that have been obvious in Barcelona over the past five years – Bayern were physical, they took advantage of extra height at set-pieces, and then they counter-attacked with wide players when Barcelona had men high up the pitch. That is essentially the standard recipe when taking on Barcelona – it’s what Jose Mourinho did when Real Madrid first appeared capable of defeating Pep Guardiola’s side, for example. It wasn’t necessarily the idea behind the strategy that was crucial, it was the fact Bayern carried it out so efficiently and ruthlessly with top-class footballers. Barcelona are a shadow of the team they once were. There was no drive, no will to win, no fight, lack of leadership. Sometimes this is just as important as tactics. Bayern wanted it more. Barcelona need to start realising that tackling, aggression, and physicality win games all qualities we possessed in guardiola’s years and not lethargically passing the ball for passing sake. Playing in front of the opposition! Not trying to beat players! We got exposed into what we’ve become a team that started to believe there own hype. As a Barca fan this was painful to watch. We had no passion or fighting quality without these you cant get results against quality teams like bayern. Not at all. Other teams have just learned how to play against possession football. The small technical footballers needed for such a close-quarters system normally lack a physical presence and the philosophy requires numbers forward which results in more space to counter-attack into. I honestly pray that people don’t try justifying Barca’s downfall to a lack of will instead of clever adaptation in the European game. Time and time again in football, new philosophies arise and are dealt with or adopted. stupid comment . minich worked the ball better in closed spaces and on the flanks than barca they for more than 2 or 3 time you see them move the ball through the right flanks from the back to a scoring position . just admit bayern were all better they were all better in one on one situations spread the ball better worked the zones better and lethal in front of the goal and most importantly got the tactics right . Stupid comment? minich? Punctuation? Your comment is painful to read and I don’t believe you’ve understood my post. My observations try to take nothing away from Bayern (they were awesome) but rather contest why Barcelona have lost their “magic”. Bayern defeated Barcelona convincingly by marrying proven tactics (did you even read the article?) with a brilliant performance. I believe since Vilanova came in, a lot of things went wrong with Barca. This season they haven’t been pressing like they used to; their passing has lacked the control that they had under Guardiola, and the defence has been a ticking time-bomb for a while now. Isn’t it interesting that three of the four goals came from the right side of Bayern? I doubt Guardiola would have have bought Alba IMO. Even if he did, he probably wouldn’t have played both Alves and Alba together because they leave so much space for Busquests to cover, and a lack of tracking back from their midfield doesn’t help. Overall, I believe Barca turned out to be a team about individuals this term because I simply can’t see Barca winning a big game w/o Messi. Btw did he play yesterday? I can’t remember seeing him! @Yinka finally a good response! Thank you! With the purchase of Alba, it was clear Tito wanted more players forward to really control the game, and I 100% agree that it was a terrible decision – Abidal covered the CB’s and filled the space at the back reliably. In terms of the team’s quality (pressing and passing), I’ve noticed that teams have dealt with the pressing in a different way and the passing is sloppy due to the press/collapse method of defending against Barca. I agree this Barca isn’t as strong as Pep’s but I can’t help but feel that Pep’s would struggle in the current European game. Your comment is indeed very stupid, Barcelona players have always been this height and they played against physical opponents before. There was no need of clever tactics to beat Barcelona last night. When Pep was the leader and Barca played in UCL, the players entered the field at the start of the game like gladiators, they were in trance; last night when the Champions anthem was playing, Barca players were laughing, goofing around, looking into the stands to find people, not at all focused. This and playing and injured Messi who doesn’t want to risk getting an injury in a Vilanova team who’s only concept of o defense is scoring more goals then the opponent meant Barcelona basically had no attack and no defense. Also Tito not making any tactical changes until after 4-0 and after Bayern were leading 2-0 for so long proves how incompetent he really is, he didn’t have a clue what he was doing. There is also the trash refereeing, 2 penalties not awarded for Bayern and another 2 goals that should of been cancelled, one for an offside and one for a foul. It would probably be irrelevant for the score, but still it was horrible. If my comment is stupid, then yours is just ignorant. Height and physicality are Barcelona’s weakness, I know they’ve always been this height (or did they all magically shrink last year?) but its clear that it is something being exploited now (they’ve always had trouble with it). Why come to a site like this if you believe tactics don’t have a role in the game? If you can’t see the same clear pattern of how top teams face Barcelona (which has been pointed out on ZM), then I honestly pity you. It was how Bayern played that completely nullified Barcelona. This even happened to Pep’s Barca against Inter, old Chelsea, etc… The teams have just gotten better at it. against PSG also they had that disadvantage but they dealt it well . so just squarely putting all the blame on height and physicality is not proper . barcelona have played against physical opponents before and they know how to deal against them so squarely saying that just because of the physical nature they lost is not proper . last but not the least i just read that messi made a statement that the teams loss wasnt due to his fitness problem . so in other words he may be stating that because of the wrong tactical system they might had played . hope you got the proper explanation and barca players are not gladiators stop being that funny . You are either retarded or trolling now. Barcelona have always struggled against physical opponents because it is a weakness of theirs. They didn’t lose solely because of it, and I’ve never stated they do. They lost because Bayern were the better team with the correct tactics to counter Barcelona. Please work on your comprehension skills. For all Barca’s lack of height, when they have time to organise their defence they cope pretty well. Of the corners Bayern played into the box, Barca actually won TWICE as many aerial duels as their much taller and more physical counter-parts! It is a recurring theme in ALL their games, so nobody can tell me the zonal marking doesn’t work. Where they have problems from high balls is in open play when a cross is whipped into the box. Actually I think opponents would be better off passing corners casually to a guy standing somewhere around the centre-line and as Barca push out they could then attempt a cross into the box. I actually find it fascinating that Real Madrid with all their physicality and height and whilst marking man-2-man at set-pieces have conceded at least TWICE as much as Barca from such plays(set-pieces and corners)!! I totally agree with you, tactics might be important but it is all about motivation and drive, which this barcelona side lacks, and it is not the players fault it is human nature, you can’t keep the same level of motivation over and over despite being their few times. The problem is people think because barcelona players are young they should be ok, but they have one every trophy at a very young age and they no longer have the hunger, therefore the team needs and injection of new bloods, new players who are hungry for trophies. This is the fault of barcelona’s management, they should have recognised this last year, it is not about weak defence, you can put the best defenders in the team they will still lose, in the past no one could attack barcelona’s defence because they were not given the chance to do it. 1-turn over of players, no one should have guaranteed place in the team otherwise they become unmotivated. That is how Alex Furguson keeps Man United going year after year, constantly bringing in new young players to keep the level of motivation high. No matter how good players are, they lose interest and drive after a while, even if they are still young, these group of players have already one everything. 2-the Coach, barcelona needs a highly tactical coach who can motivate players and charge them with drive. A coach who has flexible tactics. You can’t approach every game the same way, any wise coach would have chosen a defensive tactic against such a strong and highly motivated team like bayern Munich in munich so you can come out with a manageable tie like 1-0, 1-1 or 2-1 for bayern, not 4-0. that was a suicide to in attacking plan, sometimes you have to play conservatively to win a tie, then you can attack them in camp nou. Look at Bayern, even it is a very strong attacking team, they lied before the match and said they will not change their tactic but they did, with all their might they took a defensive tactic even in their back yard, why couldn’t barcelona do that anyone else would have done. Tito vilanova is not fit for the job, he is a nice person, but that is not enough, anyone can do his job, play 4-3-3 and hope for the best, he was lifeless on the tough line, his team down 2-0 and still no change, might have not helped but at least he could have tried. Against strong team he hasn’t got a clue. He should resign and not waite for barcelona to sack him because they won’t, but he should be honourable like Pep was, barcelona deserves a strong coach,. the whole management should change because they failed to renovate the team last summer, without Messi and poor form from Real Madrid even la liga would have been impossible. I thought it was better if Bayern won, because they are only team who could stop Real Madrid, barcelona would have lost to Real in the final. I repeat again, in sport like in wars, whoever has the higher motivation and belief wins. Barcelona needs Higuain to pair with Messi because they already combine very well in Argentine international team, he also has aerial power. Barcelona needs to vary it is game so they can give themselves options, not just go through the middle. They need to learn counter attack not wait until all defenders have gone back, not pass the ball backward, they need to score galls from corners, shoot from outside the box, high balls inside the box, put players in the box when the wingers go forward not pass the ball into the box and no one to score. barcelona is too predictable, go through the middle which people have learnt how to stop. Barca B players should replace current players, two centre backs and a striker who is good in air, I hope barcelona will wake up this time. Good comment. I agree with all, but one aspect. Defense was extremely weak last night. And that goalkeeper… he should not even play at high level. So far having a weak goalkeeper in an extraordinary team like Barca has worked well because it gave some chance to the other teams to score and that meant the football was not over, but now this clown has to go as fast as possible. Rubbish. “No drive”, “they wanted it more”, “lack of leadership”, “no passion” are codewords for lazy analysis. Barcelona won the league this year rather convincingly, you can’t do that with players who ‘don’t want it’. They were outplayed by Bayern. The weaknesses in this team have been known for some time (lack of aerial ability, over-dependence on Messi, vulnerability to counter attacks), and Bayern to their credit took advantage of it beautifully. So they lost a semi-final against a really good Bayern side (that should have won it last year), it’s not the end of the world and they are certainly not a ’shadow of the team they once were’. It’s just your brain being lazy and falling back on rubbish sports journalism that you’ve been fed your whole life. Great performance from Bayern early in the morning (from Sydney). I haven’t seen such Bayern for about 12 years (from ‘01) in champion league 2nd stage. They recently outplayed Man utd, Real Madrid, to name some, but only by away goals (2010) and penalties (2012). I will be glad to watch they take on Real Madrid in the final this year (assuming Dortmond under perform following the untimely announcement of Gotze’s transfer). How much of a concern is it in your mind that Martinez picked up a yellow card and may have to be less aggressive in the second leg so as not to miss the final if Bayern make it that far? I think Vilanova has got to go, Barcelona are getting worse under him. Yes, they’ll win the league, but only really because Madrid’s league form has been so poor, and elsewhere they were tactically outclassed by Mourinho and Real in the Copa Del Rey, and bar a miracle have been totally humiliated by Munich in the CL. Guardiola left because he knew the team was on the decline, Vilanova has taken over and continued to try and play the way that Guardiola was, only far less effective. There much slower in possession, less intensity in the play, and the pressing they were once renowned for has just seemingly disappeared. Tonight I thought his tactics were wrong from the start, it clearly wasn’t working in the first half, you’d expect a change for the start of the 2nd half, or by 60 minutes when they’ve gone 2-0 down, but he left that side out till the 82nd minute and when they was 4-0 down! Completely clueless management. Interesting comments. Do you believe that Barcelona is on the decline or that other teams have become more effective at shutting them (and possession football) down? I always thought Guardiola left because he knew other teams were catching on (particularly Mourinho) and the Italian teams were on the rise again (Not to mention he received the golden generation of la Masia). Just as a side point: Their transfers are rarely successful as adapting new players into Barcelona is also a huge weakness because their philosophy is radically different to normal football. I agree, clueless management, but it’s hard to make effective substitutions when your whole squad only know how to play one way and are of a similar mould. Think it’s a combination of both Basedd. Teams seem to have sussed how to play Barcelona, but I think that’s partly down to how Barcelona are playing as well. Last night the system was the same as what I consider the vintage Barcelona of 2010-2011, bar Alba at left back and Bartra instead of Mascherano. But last night looked a shadow of that side; no intensity, slow in possession, and of course, non existent pressing. In 10-11 they came up against teams that played very defensively, but they found a way through. They sped up the play, added a bit of intensity, they just seemed unable to do that last night. Would also disagree he couldn’t have made an effective substitution. For a start, anything would have been more effective than what was produced in the first half, and I think it was an easy decision to make, Messi needed a runner infront of him to help get more space, and a runner in behind would have stretched Bayern even more, as it was they had nothing to deal with. Messi was dropping so deep, and Pedro,Sanchez were going way too narrow and offering no threat in behind, Bayern literally had nothing to worry about, yet Tito changed nothing at all. Barcelona need a new start. Same philosophies of good football, but someone who’s going to inject some much needed urgency and will to win back into the players, because there clearly wasn’t any last night. Keeping Tito is basically keeping a poor man’s Pep. It’s like there trying to continue the Pep era with someone they know has been around Pep, so there hoping he’d continue his success. Problem is, he’s clearly less respected by the players, and far less tactically aware than Pep. Bielsa or Klopp for me. Thanks for the reply, I completely agree with a lot of your points and Bielsa would be an awesome choice (I wouldn’t want Klopp at Barca). However, their 2011-2012 champions league run encountered their ideal teams; Arsenal and Man Utd have very English defending and aren’t used to a structured defence, Shakhtar were Shakhtar, Real Madrid were still finding their identity under Mourinho and their group stage was against 3 very weak teams. No Chelsea, no Italian teams, no Bayern, or any other well-structured, organised defending teams. Don’t you think that may have been the case? Tearing apart defences that aren’t used to defending in stages? I think it’s more Barca in decline than anyone else catching up, they are getting older. Puyol is often injured, Xavi is older, etc. Plus, like others have said they seem a bit lacking in motivation. And even some years ago the “sit deep and counter’ was the strategy most teams employed against Barca. ’sit deep and counter’ is a bit of an insult to Bayern! 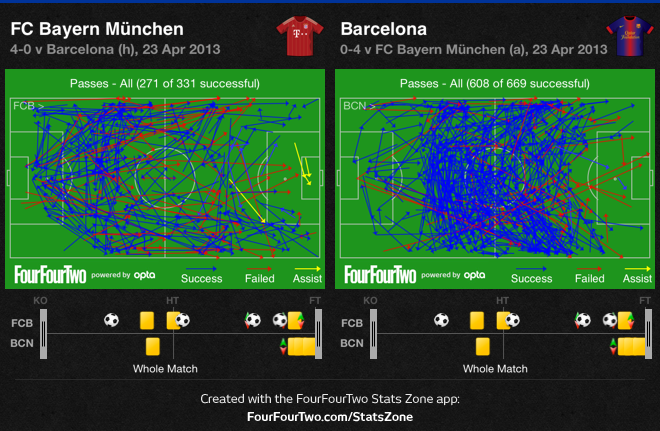 Bayern used the ball in the 30 minutes they had possession far better than Barca in the 60 they had it. I would imagine that a heat map for Iniesta would show him about 20 metres deeper than his CL average. Barca have never been comfortable without the ball, they have to work extra hard against another good possession side to keep it (due to the opposition pressing and lack of cheap turnovers), where Bayern were able to keep Barca at arms length with a structured defence. I’m going to go out on a limb and blame Michael Laudrup for this result, he showed Wenger how to use surrendering possession in certain areas to the team’s advantage, Wenger then used that against Bayern at the Allianz and now Heynckes has refined it. Sometimes when you make a change, it doesn’t have to be change for its’ sake. Maybe he couldn’t see how the guys on the bench were going to bring anything different to the game? The team he had out simply wasn’t working, he HAD to make changes. He had options on the bench, there was tactical adjustments that could have been made, he just wasn’t tactically aware enough, or simply not good enough a manager to do so. With a 4 goals cushion and no away goals conceded, Bayern can start Gustavo instead. Schweinsteiger， Martinez， Lahm， Dante ，Gustavo are just too important for us. If we go through this round and face real in the final， it would be diastrous for us. Mou would certainly get the better on that. Fort Bayern has Tod play the second legte. And I think Dortmund will be Moore dangerous for Bayern than Real. But I think Real is favourite to go through to the final. Real knows Dortmund now better and has something to prove (and oft course Real wants to win the competition). But Dortmund has not hing to loose, and they know how to beat Bayern. It would be tough, but it’s possible. S*** when automatic typo correction is set to a different language. yeah, why not. Gustavo deserves a sniff. He does have a good left-footed shot also. Won’t mind him scoring one of those. If I were Heynckes, I’d play it safe and not play Martinez at all. Luiz Gustavo is more than adequate cover. Wow… didn’t see that coming. Bayern seem to tick more boxes than any other team in Europe. They’re like an ‘all-weather’ team, who can do a bit of everything. - reduced space between the lines: Milan found out you can’t allow Messi (particularly) to run and shoot from that range. Bayern didn’t. - the incredible fitness of Bayern’s players. To maintain that intensity for 90min is quite something. - Barca’s Messi-dependence is not only tactical, it’s down to the fact that there is no-one else who can do what he does – in world football. Lastly, and perhaps most pertinently, Barca finally met a team who believed themselves to be their equal. Did that rob the Blaugrana of that psychological advantage? It appeared so at times. Congrats, Bayern Munchen. One hand on the cup…? It’s been a long time coming, the need for Barca’s defensive stability have been passed upon in the last 2 summers (Puyol’s not exactly getting younger, is he?). They may be complacent in La Liga but you can’t be in Europe. End of an era really, need to purge and rebuild. Credit to Bayern who played very well, but Barcelona were woeful, Vilanova doesn’t have a clue. The 4-3-3 Messi as false 9 system that was used so successfully under Guardiola clearly isn’t working anymore, why the hell is Vilanova persisting with it? An average Milan side defended very well against it, Madrid have completely worked it out, yet Vilanova still decides to play it against Bayern Munich?! Who ever was behind the system used in the 2nd leg against Milan, who knows, I’d say probably not Vilanova, but what’s true is that it’s far more effective than the 4-3-3, and it must be asked why it wasn’t used tonight? The 4-3-3 has just become so slow and predictable, teams know how to play it. Defend narrow, pack the central areas, and encourage Messi to drop into deeper areas where he’s not only less effective, but also going into zones already congested with players, job done. Pedro and Sanchez were poor tonight as well I thought, kept coming in far too narrow, and offered absolutely no threat in behind. Pretty much killed the team. Messi was poor tonight, he did drop too deep, but when he had the ball there was nothing going on in front of him due to the poor positioning of Pedro and Sanchez, I really don’t know what Sanchez offers Barcelona, overated player that’s been a complete waste of money in my opinion. Also thought Bartra had an absolute nightmare and looked out of his depth. Looked so nervous in possession, positioning was poor, reading of the game was poor, and just for the record, isn’t even remotely near the quality of Raphael Varane, not even close. Well played to Bayern though, could be the end of an era for Barcelona though, they need something of a fresh start next season, and that definitely does not involve Vilanova. Regardless of how poor Barcelona were, Bayern had literally everything you need to get this sort of result. Poor refereeing, 2 (arguably 3 if you deem Dante’s use of Alves to achieve an extra 2 foot a foul) goals which shouldn’t have been allowed & a poor surface. I feel sorry for Tito for his incoming storm. You can talk tactics all you want but to deploy those tactics, players need to perform & they didn’t: But the drenched pitch didn’t help. The pitch surface is so important for Barca’s players and everytime they play on a poor one, you can tell the players get (wrongly) disheartened by it. A snooker player wouldn’t accept to play on a ripped surface would he.. There was no way Barca could shift through the gears or really develop play enough to really get in & around the final third; apart from being unloyal to there style & go all-out Stoke. But, meh. Bayern fully deserved it, although I was disappointed slightly. I wanted to see 2 pressing, passing, attacking teams. Instead they just resorted to the bog-standard tac against Barca. But Barcelona added up the performance themselves when they went 3-0 down and Pique & Bartra exchanged 5 passes between themselves. Just had no urgency. Are you related to Xavi by any chance? Well, Cruijff’s Ajax was able to adapt to conditions like the pitch, weather, or refereeing. Lame excuse. The opposition has no responsibility to build their pitch to suit you. If they thought they had a better chance beating Barca on an anthill it would be fair. Especially since 90 minutes of this fixture will be at Camp Nou. Schweini and Martinez combo reminded me of Khedira and Alonso. Martinez bombing around, tackling hard, running forward, with Schweinsteiger more disciplined and distributing calmly from a deeper position. This changed when Gustavo came on, but I thought the similarities uncanny. Also impressed by the defensive work of Gomez, Robben & Ribery. Heynckes has created a very well-disciplined team, though Bayern’s near misses may have much to do with these “luxury players’” level of desire. And I think this game was a beautiful proof of Michael’s thesis that Barca “too reliant on Messi.” Mind you, Barca’s dominance of possession was never as comfortable as usual, so the diminished effect of Messi was an extension of the difficulties faced by Barca’s midfield. yeah, i’ve read that article. so many people went on criticizing it. but with current barca squad i really do think that they are too reliant on messi. Schweini and Martinez are more all-rounded than Khedira and Alonso: one lacks technique and one lacks mobility. Schweini is absolutely one of the very best central midfielders, and probably Martinez too after yesterday night. agree, I really like Schweini+Martinez Combo. Possible the best MF Combo at this time. Alonso’s long pass is better but he lacks Schweini’s mobility. Think before you drink before you post. Tiredness can’t be really an excuse for Barcelona they rested most of their players, just like Bayern. Bayern thoroughly deserved their win and were better than Barcelona, but I feel that 4-0 flatters them a little. Bayern’s second goal was offside, and Jordi Alba was clearly obstructed for their third. Lionel Messi had an bad game and not just for his standards but to be fair to him he didn’t look anywhere near fit enough to play. The decision to rush him back from this hamstring injury shows that Barcelona themselves feel that they are toothless in the final third without him. Vilanova didn’t make a change until 83 mins when they needed a change at half time. Fabregas and Thiago were unused while Sanchez (Barcelona’s worst player)stayed on the pitch for the entire game. yes, and there were two clear penalty shots for bayern in the first half, so it evens out. During the time that they had Yaya barca also had something else: Real strikers. They need to get a holding mid who can pass as well as BE PHYSICAL. But they also need a True no.9 (they could have benched messi and used villa). Fabregas initially replaced Patric Viera at arsenal – maybe he should get a chance to play in Busquets role. Or just BLOODY USE SONG. but then that would mean they have to play conventional football? P.S Alexis is Useless – Khedira scores more than him! Munich was a deserved winner – there gameplan and it’s execution were spot on. 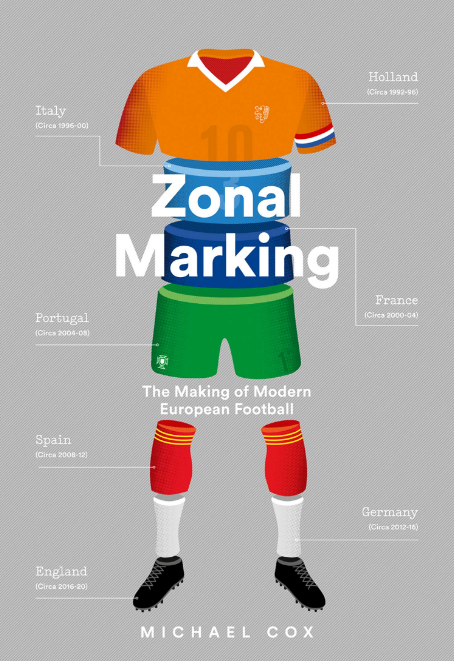 I’m a Zonalmarking fan since the begining. I don’t like Barcelona and I’m aware of the ‘no referee discussion politics’- but in my opionion the whole tactics discussion is without merit when the first three goals were illegal. that’s fundamental right but without Müllers foul on Alba this counter would never have resulted in a goal. It’s a shame that some results during the Champions League knockout games were determined by referee errors. In my opinion this CL season showed that the offsidetrap isn’t a proper concept anymore (Examples: Milan vs Barca, Paris vs Barca, Bayern vs Barca)it doesn’t make sense for example to defend corners with a zonalmarking concept and “clear” the posts because the risk that the referees make the wrong decision is too high. Bayern were the deserved winner without any doubt. They should have get one(?) hand penalty. But my point is that too much games at this level are decided by referee errors instead of tactics, skill, teamspirit or even luck. It’s very frustrating. That is a debatable point, but not in this case, Munich were by far the better team in all aspects. That was the deciding factor. @D – I never argumented that Munich wasn’t the deserved winner. But without the “errors” (incl not given hand penalty) they propbably (who knows) would have won the game 2-0 and this contest wouldn’t be over after the first leg. Sure, but why did Bayern get any favour at all from the referees? In a way, tactics. Barcelona never would have created any of the three controversial situations where Bayern scored. It says it all that Barcelona had as many shots as Bayern had goals (and half of those were Bartra!). Not unlike how Barcelona have gotten plenty of sketchy calls in their favour in recent history, in part because they put their opponents in a position (needing to tackle, mostly) where they are liable to be called for a ‘foul’. Müller’s block on Alaba was the game’s highlight. Not a fault at all, just pure genius positioning. The referee was pretty spot on at all times. Alba went down way to easily and theatrically – would have been a shame to disallow robben’s brilliance because of that. - lack of ideas in midfield, we did not see tonight at all any of the brilliant one-twos and turns in the centre of the pitch Guardiola’s Barça did all the time. compare to the 5-0 over Real!! 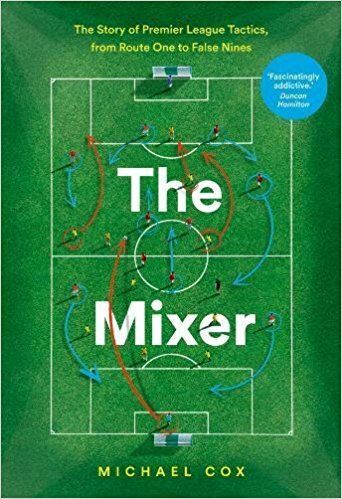 - an inherently traditionally dominant team within a top European league will benefit from when their whole nation is experiencing a renaissance of footballing ideas: it fuses both possession-based technical football and furiously quick, physical, aerial football with an incredible ease. I think this is where they’re better than Real Madrid, tonight Bayern did the latter but can also do the former, Real can’t. - they’re on the back of a German wave financially as well: they always cannibalized top players from the German league and Dante, Neueur and Mandzukic are examples of that, but now those players are better as their whole league is better, plus they can also get the odd player the whole world wanted to sign like Javi Martinez – FANTASTIC performance tonight. Now add Gotze.. oh dear. - their current game, completely unlike Barça’s, is not based on one player. What’s their biggest threat? Is it Ribery’s and Robben’s dribbling as they cut inside, is it the attacking fullbacks running into the line to cross the ball into Gomez, is it Muller’s clever off-the-ball movement to show up unmarked, is it their set pieces? All being said and while there’s trends to analyse, this was one game, tiki-taka has won an awful lot of trophies over the last few years and did not necessarily die tonight. But Barça will be asking questions and won’t blindly trust their philosophy as much from tonight onwards. I also think a certain young, Brazilian mohawked forward will be replacing a certain Chilean underperforming forward next year (and regardless of how many of you don’t rate him, that would do wonders to solve one of their many problems); and they will swallow their pride a little and give Deulofeu a go too despite his giant ego. And will hire at least one proper centre-back: Hummels? Really good points raised there. Pretty much a cohesive summary of all of Barca’s woes. No wonder Barcelona did not win a really competitive game in quite some time. Unfortunately, I don’t really think even 3 top-class players (e.g. Neymar, a solid CB and perhaps another attacker) will address all the problems. Excellent post, some very well thought out and reasonable thoughts. I also like to second that tiki taka is not dead, like all things in football, teams adjust and tactics change. Bayern figured out a way to combat tiki taka but it also takes perfect execution on behalf of Bayern, this is not to say if they replayed this game again, that the same result would happen. Sometimes the tactics just dont pan out. That’s what you get for not buying defenders and trusting Pique, who does nothing but stands there watching Muller and Gomez scored. Btw, Tito did not coach against Milan, he was sick. And be kind to a person who just suffered cancer. He is just useless, deal with it, using the subs after 4-0 WTF? Do you like Chris de Burgh? I’d like to compare this Barcelona to the team from 2011. Perhaps that’ll put things to light. 1) Tito is a very poor tactical manager. He may have demonstrated success against weaker La Liga opposition but with quality players almost any top level coach can. Now that he is gone we realize what a truly remarkable coach Pep Guardiola wins. 2) The team looks like it has a lot of passengers. While Dani Alves, Jordi Alba, Xavi knew what to do and Andre Iniesta forced a lot of plays, the rest just didn’t have a clue what to do. Alexis Sanchez was isolated a lot, Rodriguez didn’t offer width and Busquets made one too many critical mistakes. Lionel Messi shouldn’t have been on the pitch. 3) the refereeing is absolutely horrible. I can’t recall one top level match that gets by with good officiating. Is HD TV exposing flaws that have been there since time immemorial? Are referees getting worse? We need technology instead of humans so we can call a spade a spade and the best team gets through. I don’t know if rebuilding is the answer. Xavi wasn’t bad, Andres has his quality and so does Gerard Piqué. But there is no chemistry in this team. Sanchez needs to go. But if you have to deploy a system and make it work then you have to perfect it. Madrid and Dortmund have perfected counter attacking football, Pep did the same with Tiki taka. Tito doesn’t know what he is doing. After all Guardiola deployed Mascherano and Busquets as CBs on the way to the UCL podium in Wembley back in 2011. How on earth does Gotze move to Dortmund? Can barcelona fill Carles Puyol’s void with Rafael Varane? Bayern and Dortmund are only rivals because of quality. The bitter, geographic rivalry isn’t Dortmund-Bayern, it’s Schalke-Dortmund. robben had a point when he said he’d not prefer dortmund. it’s because dortmund have the players to get a result vs. bayern. dortmund vs bayern battles have been low-scoring affairs bar that 5-goal humiliation in last year’s pokal final. strong in the air, quick on the ground, fast on the wings… that’s what dortmund would have presented bayern had they been drawn together in the semis. A near-mirror of themselves. and you know bayern… these days, it’s bayern who beats bayern. anything close to bayern (which is dortmund), makes for a thrilling encounter. Oh I know. I fear Dortmund more than Madrid. What Puyol Void????? For the last three seasons Puyol has been injured almost as much as He’s Played! They should have had a backup o long time ago!You can also forget about Verane! Madrid wouldn’t sell Barca a venereal disease let alone their best prospect! First time I’ve seen that a goalkeeper vs Barcelona was kind of a spectator. Neuer had one shot on target which was a weak shot directly at him. Credit to their defensive team effort and credit to Heynckes to get ROBBEN!!!! and Ribery to doing their defensive duties for 90 minutes. Unbelieveable how good their defense is the whole season and how few chances they concede. Great Bayern, but result flattering. With decent referee, it’s 2-0, and who knows what can happen in the second leg. Although this Bayern looks very solid, Heynckes surprising the world at the end – or not? – of his career. And an applause for all the experts who told us before the game this could be the game in which Barcelona could very well lose possession for the first time in x years… In the end, classic set pieces + counter attacking. Same tactics as your average La Liga team, but of course with a better result since it’s executed by players with more quality. Finally, someone mentioned missing Kroos. This just helped their tactics, Robben on the right far more effective in such a game than Muller would have been. poor refering? ha ha ha, poor barcelono kiddo, 3 penalties for Bayern were not given, go cry to the corner. 3? 1, hand ball pique. The referee took an exciting return game away from us. do YOU remember chelsea?? red card abidal for the phantom trip??? Get the ball wide and cross it into the box for the big fellows. They’d do well on a wet Wedensday at Stoke. When Guardiola arrives at Bayern, Barcelona should go get Heynckes, Thiago Silva and a scoring winger. Let the whole squad do nothing all summer and then return hungry and school everybody. And it’s best for Bundesliga clubs, especially Borussia to start despising Bayern the way Madrid and Barcelona despise each other. Maybe then Dortmund will smarten up with their transfer policies. WOW. I guess this is why Baryen are #1 in the world. ZM is exactly right, Bayern where the perfect team to attack Barca’s weaknesses. The problem with Barça being Barça is mainly squad depth…. Under Rijkaard they always had a core of players who’d join the team from the bench. Under Guardiola, who believes deeply in building their own players, they had a lot of youth team players that would fill that role. Now they don’t have neither…. They don’t have the big name depth Rijkaard had, nor the youth depth Guardiola created…. They are lacking in several areas of the pitch. And more importantly they have no variety to offer from the bench. “they pressed the opposition at goal-kicks, preventing them from playing the ball forward into midfield easily…but once that press had been passed through, Bayern dropped deep into a solid defensive shape”: this was made possible by Barca’s tendency to very deliberate build-up play. If in doubt, their players would decide not to risk possession with a pass forward but instead to turn the ball back to a team-mate. This gave time for the Munich players to run back into defensive positions after their upfield pressing. Barca have been rumbled. Those Bayern tactics might not be the right ones for playing against, say, Real Madrid. No doubt they’d change them. To against madrid，bayern would have to shut down Xabi Alonso，so that ozil will have to drop deep to receive and distribute the ball. Bayern would also have to park buses on the side rather than in the middle because of CR7 and Di Maria. More importantly，bayern would have to slow down the tempo and retain as much ball possession as possible. This meant that whenever a Barca player picked up the ball on the wings (which seemed to be where they kept going with the ball), the Bayern centerbacks could support the outside defenders while the centermids picked up the Barca player’s coming for support. This seemed to constantly result in Bayern having 3 versus 2s against Barca attackers, and they consistently were aggressive in those siutations and won the ball, which led to quick breaks. Had Vilanova added Villa to the mix earlier, the centerbacks wouldn’t have been able to be so involved, and Barca could have had a lot of 2 v 2 situations that would at least give them a chance to retain possession and create chances. I think you’re spot on about the rest of it. I thought Muller’s pressure on Busquets was also very important. Martinez and Schweinsteiger certainly had good games dealing with Iniesta and Xavi. Xavi seemed to really drift out of this game, and Messi should never have played. Zonalmarking is Michael Cox’s blog… Check the author of the article you linked. And by a man named Michael Cox of all things! What are the chances?! Mark, how do you think Mario Gotze’s transfer to bayern? How will it change the way bayern plays? With Gotze’ coming to bayern, is this a potential indication that Robben will step out? I would say it is an investment into the future; since 4 years now Bayern plays at a very high level and if they reach the final it would be the 3!!!! final in 4 years!…players get tired playing at such a level all the time (see Barca!!) and I don’t believe that all Bayern players will be able to carry the focus they show now into the next season. What on Earth was with Bayern’s loss to Arsenal? How did that almost massive blip happen amid so much dominance? and not forget that Arsenal were really lucky to get that 2-0. Bayern had almost 5 times more shots than arsenal and 5 to 2 on target. Arsenal just used all their chances while Bayern used none. With so many insightful comments from you all, I would like to add something different. 1. Muller has evolved into one of the very best attacking players. He simply has everything. And worth specially mentioning that he is so smart with his movement. I wonder what the German did to the youths in last century- Muller, Kroos and Ozil are nearly perfect in tactical sense. 2. Barcelona (and Spain) has just gone unreasonably too much in ball retention. This makes plays slow and predictable. The victory of Spain in Euro 2012 had provided an illusion that ball retention is the best approach. I would say Spain were lucky to win Croatia and Portugal, while France destroyed themselves internally. This season, every time Barcelona faced a defensively-disciplined side, they were in trouble. 3. Barcelona’s defence has been overrated. This point is surely noticeable before the game. Even with Puyol and Mascherano, they are still not good in defending. Puyol is too slow now, and Mascherano simply doesn’t have the body and the positioning sense to be a world class centre back. Daniel Alves also has positioning problem and lacks concentration at times. Alba is a decent defender, but he is rather weak in battle. The team misses Albidal. 4. Bayern is just close to perfection. Even Robben pressed fiercely to win the ball, then what else can the team not do? However, one weakness to mention, if needed, they lack killer passes in the final third. Juve and Barca played the wrong approach as they did not defend compact and deep enough. Juve didn’t realise the margin between themselves and Bayern, while Barca even thought they were better than Bayern. Interesting to see if Bayern versus a “Chelsea 2012″-like side in the final. Spot on on Muller and Abidal’s absence. These were the two key players yesterday. Define “defensively-disciplined.” Every team Barca face attempt to play defensive football. By that standard Barca are very rarely in trouble against defensively-disciplined sides. If you mean teams that played a brilliant defensive game, then it’s kind of redundant. That’s like saying Barca always dominate against teams playing poorly but don’t do as well against teams playing brilliantly. Or even more simply that it’s easier to beat teams who aren’t as good at football. A fantastic victory for bayern, even if they did get some questionable decisions with a couple of the goals. Defensively: Dante kept a clearly unfit messi subdued, boateng swept up behind and the fullbacks aggressively pushed barca wingers back, an important step as it meant they couldn’t offer runs in behind for messi et al to pick out. Schweinstager played his best cl game in a while and won his individual battle with xavi. Xavi has lost some of that energy that was so important in allowing barca to press, without it bayern could pass through them. Javi Martinez was excellent against iniesta, keeping him quiet and forcing him to defend against his bursts forward, motm for me in signifying what bayern did best. Robben and ribery were actually pushed back quite well by alba and dani alves (the only area of the pitch where they were winning their individual battles) bit once Bayern had a secure lead, the fullbacks had to leave too much space in behind. Mueller was also excellent in both pressing busquets and storming past him in attacks ala welbeck against alonso and lavezzi for psg. If barca had a better cb partership then maybe busquets could have dropped deeper and they could passed out of the press. Gomez predictably targeted the inexperienced bartra and found chances in the box. Pique actually played quite well I thought, but couldn’t be everywhere, he needed help. Thought valdez could have done better at set pieces/goals. Overall Barcelona couldn’t press well because of the unfit messi and ageing and overplayed xavi, who were both so key to the past high intensity pressing game. While bayern pressed the midfield and wingers into deeper positions and targeted the weak leak in defense with one of the best goal poachers in the world. Bayern were excellent but the Barcelona of old would have won this game, especially in passing their way out of Bayerns pressing. Arguably the worst performance for some years. Not even the intelligence to keep the game alive for the second leg. A fit messi would have changed things, but it shows how far the rest of the team has fallen. The standard recipe well executed is true, but only tells part of the story. After all, the standard recipe wasn’t doing too well a couple of years ago! The loss is good for Barcelona – it further exposes structural problems with their squad and tactics that they have been unwilling or unable to address. Many have mentioned the strange unwillingness to play the younger players more, giving them experience and resting older players. It is clear that the starting squad as it is runs out of ideas in matches such as this. Rest and mixing up the players is what helps refresh minds as well as bodies. I don’t understand why on earth Barca, given their style of play and player, don’t use a larger squad. They’re just burning out their players and exposing themselves to an unnecessarily difficult transition when this cycle is done. There’s the over-reliance on Messi. The idea of not resting him periodically – I just don’t understand. He’s not super human, as we plainly saw against Bayern. And the fact that he was not taken out of the game early points to a deep problem that must be corrected vis a vis Messi. It was plain for anyone to see that Barca were playing virtually with ten men, yet Tito leaves Messi in. It can’t go on like this. Barca don’t seem to be working on their players’ weaknesses, while other teams are (or are getting better players). They have three midfielders, especially Busquets, who simply don’t shoot well enough. I haven’t seen improvement. To counteract age and familiarity, their players must diversify their skills, not just get better at tiki taka. But then again, how can players work on their skills when they’re playing nearly every match! Non-responsive tactics, and this was hardly the first match. It was obvious how the game was going to go after the first ten minutes. Messi was nonexistent, pressing with ten men was leaving huge gaps, Bayerns counterattacks were dangerous, and the corner count was too high. Yet there was no response. It was telling that at the end of the match, those same problems existed. Bayern was not forced into any adjustments! Overall lack of a diversified strategy. An important component of any strategy, such as tiki taka, is using another strategy once in a while to disrupt the opponent. 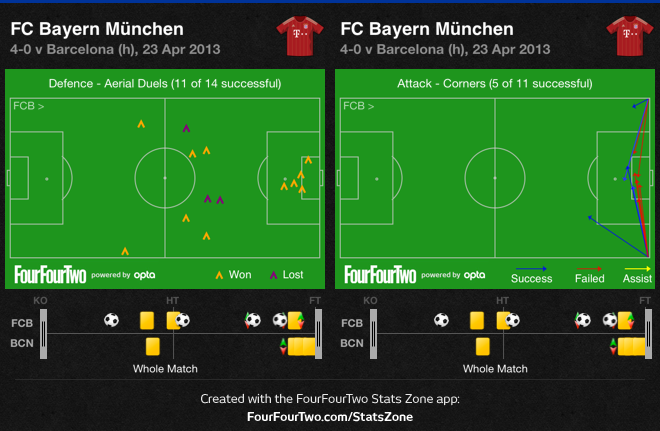 In this match, with Barca a man down and Bayern so efficient, possession was never going to be enough. But the players can only play that way and so couldn’t make any adjustments. For years now, the Barca way has been to use their excellent on the ball skill- passing, dribbling, and even ball tackling – to overcome their many weaknesses. These are weaknesses that no other team could get away with such as being much more inferior to their opponents in strength, speed, and height, having a poor central defence, and poor shooting/finishing. If they want to continue eschewing physicality for the beautiful game, they better make adjustments on the above points. This is one of Barcelona’s huge flaws. They are playing with possibly the best footballer ever and their offence is designed around him. The fact is that no one can replace him effectively. So, when they rest him, are they meant to play Fabregas as false 9 or employ a different formation in attack instead of false 9? I completely agree with all your points – Barcelona’s game has hardly changed over the last couple years (if anything, its stagnating) and the other teams are catching onto countering it. I doubt they can diversify their system as their possession philosophy is what has been drilled into their star players since their youth and their line up isn’t exactly conducive for normal football – what would you suggest? Teams seem to have learnt how to set up the midfield defence against Barca. Bayern’s positioning meant they were screening all the cut through passes Barca usually make so Xavi and Iniesta almost never had a clean through ball through the defence. It seemed to be a similiar set-up (and so problem to Barca) as Milan, Celtic and Madrid. Barca run the risk of becoming too easily predictable. The other thing was how shockingly slow Barcelona’s transition has become. The biggest difference now between Barca and Bayern, Madrid etc is other teams look for very very fast transitions and are also increasingly able to keep the ball, so they have options at different paces. And if you’re a foot and a half taller than the opposition, playing for corners is an obvious tactical approach – one which Bayern were very happy to play for. bayern won fair and square…sure at least 2 of their goals shouldnt have been given, but there were also one, possibly two, hand balls in the box by barca (alexis’ would have been a bit harsh since the ball was headed on to his hand from 30 centimeters away). all that said, im surprised nobody mentions how the waterlogging of the pitch very clearly affected Barca’s passing game. i simply cant remember a time when they gave away so many passes…and im not just talking about bayern’s great defending. there were way way more ‘unforced errors’ than the norm. bayern still looked the better team. This result has been coming for a while and I wrote on another site that Barcelona were due for a trashing. Barcelona has went through the motions this season, playing on reputation. The biggest Barcelona for me is the absence of true wingers, players like Robben and Ribbery, who can take on the full backs. Barcelona had these players in the past but hasn’t replaced them. Pedro and Sanchez are finishers, not true wingers, able to play one against one, like Henry, Overmars, Ronaldinho, Eto’o, etc. Pedro and Sanchez do only one part of their function, and that is stretching play, but opposing full backs aren’t bothered by that because hey hardly cross the ball into the box. Having true wingers who can beat their man forces one of the central defenders to provide cover. Boateng wasn’t tested at all in this game, it’s as if he wasn’t playing. Also looking at the benches of both teams, it’s quite clear that Barcelona have neglected to bolster their squad. I’d like to politely argue that Barca as they are setup now, cannot really use wingers because they never really cross the ball into the box in the traditional sense (to look for a header or tap in). Anytime Alves or Alba get to the bye line, their first instinct vis a vis tiki taka is to cut back inside and play it neatly to keep possession. This strategy is good and has worked for some years now. Problem is, teams are figuring it out at the highest level. Barca like all good teams cannot get too fixated on one style (tiki taka) because good teams should be able to adapt to different styles of play as well styles of play are constantly evolving in world football. But all is not lost for Barca, nobody can win everything forever. They just got beat by a better more hungry team. If they played this game again, its not certain that the same result would happen. I now see why Pep left Barcelona and decided to join Bayern. He saw the downfall of Barcelona coming after only winning CDR last season, and being beaten by Real Madrid at Camp Nou. Now he is taking over Bayern after seeing how good Bayern have become. Such a glory hunter. Barca didn’t turn up, but for me this was one of the best performances I have seen from any team at any level, club or international. The organisation was obviously excellent, but it was the execution which did it. Ruthless discipline from start to finish, absolute concentration and incisive counter-attacking. Bayern played brilliant football in every sense. Schweinsteiger was incredible, he is the complete midfielder he passed it as well as he won it. And who knew Robben had that defensive effort in him?! It reached a stage where it could have been 6 or 7. Just think about Bayern’s future now, Guardiola, Gotze. They may be set for something pretty special. In regards to Barca, it was sad to see them like this. It was an anaemic performance which lacked any sort of intensity. If people talk about “Plan A” and “Plan B” well this was neither. Look at the great goals Barca have scored over the years, there is always always movement involved! Frequently from more than one player, a decoy run, someone opening space for someone else. It just wasn’t there tonight, there was no desire to break beyond the ball and drag a bayern defender away. They miss Guardiola like hell. I remember reading an interview with Dennis Bergkamp where he thought it was a shame that most clubs now only have one player moving to receive the ball, he said only Barca, Ajax and maybe Arsenal have more. Well in this match (in an aggressive forward going sense) they had none. It was a fine technical display from Bayern, but was primarily based around the (only?) three tactical weaknesses that have been obvious in Barcelona over the past five years – Bayern were physical, they took advantage of extra height at set-pieces, and then they counter-attacked with wide players when Barcelona had men high up the pitch — absolutely right ZM. Congratulations to Bayern as a Barca fan. Two goals were unfortunate, but even that doesnt matter as Bayern were much better side and deserved the win completely. One point about Barca. I thought it was odd that Cristian Tello was left out of the match squad. I think he has been Barca’s strongest winger in the past few months. Sure, he’s inexperienced but he’s always dangerous when he gets the ball and runs at the defence. You get a sense that something might actually happen, and he’s getting better at finishing, too. Compare that to Alexis, whose contribution is trying not to fumble and lose the ball, and trying to pass it safely back to Iniesta who can then try to do something productive with it. To put it bluntly. So why no Tello? I agree, Tello appears to have more confidence than Alexis and be in better shape than Villa. However it’s perhaps a little simplistic to blame it on the forwards/wingers when there wasn’t a lot of passes for them to run onto. Barça are strikingly lacking a lot of penetration into the final third, and that doesn’t only stem from lack of running from the forwards with and without ball, it also comes from lack of service by the midfield. The through balls, where have they gone? They do depend on the opposition defence leaving enough space for them (and for a very long time now I have not seen anyone trying suicidal high lines against Barça), but Barça seem unwilling to risk with the final pass. Then there’s a problem even earlier than those killer balls, which is that the midfield now seems less able to play their way out of trouble quickly in deep positions. There’s a lot fewer clever one-twos in central positions. All of this contributes to less meaningful penetration at the end. You beat or at least loosen a packed defense with late runners and getting (low) crosses in behind the defense. Barca has been doing neither for a long time now and it’s part of their undoing. Their strategical and tactical rigidity astounds me. It’s not a matter of philosophy. Once in a while sacrificing some possession for somewhat direct play is not anti tiki taka but actually enables one to play tiki taka! Barca will end up killing tiki taka if they don’t take some chances. One other thing. Does anyone else think that in the away legs (especially against Milan and Bayern) Barca has started the game way too cautiously? It seems they try to avoid any risks. Maybe that’s because of the utter chaos that occurred in the opening minutes of a few recent games against Real Madrid. But it leads to the situation where they can’t catch any positive rhythm. It just looks lazy, there’s no pressure. The opponent doesn’t feel threatened and grows more confident (and eventually scores). Contrast this to the situation in the return leg against Milan where Barca had to play with 100% fire in the belly from the first minute. There’s just a world of difference. Oh and btw, Jordi Alba is a fine player but he has some growing up to do. You don’t throw the ball in someone’s face even if you’re losing 4-0. Tello had a very poor performance a few days earlier against Levante. Excellent analysis as always Michael. Bayern completely nailed it yesterday. The kind of defensive display that Ribery and Robben had, clearly reminded me of the playing diagrams i have in the book. Using someone’s blog to publish and advertise your own stuff is highly unethical. Hope your book doesn’t sell at all and is donated to a second-hand bookstore. Sorry Kevos, but Michael is aware of my book and i’m just stating a fact. My book is not new and it sells what it needs to sell. I’m just glad that when a team used something similar to what i see as the best way to beat Barcelona, that team completely trashed them. first off havent i written this many times that messi like to somebody upfront than being a target man alone a thing which he is not capable of or doesnt not likes . alexis playing was a bit of a surprise of me given villa’s contribution in last round against PSG . i think the way barca lined up or played was more of villanova’s idea because in the past through this season we had seen barca playing this way and struggling . second thing is bayern success because they were able to stop the ball reaching the attacking third and were able to close it down stopping barca from playing fluidly . you had written the analysis correctly but barca’s fault rest on the shoulder on villanova who was once again adamant with his shape . changing personal doesnt change too many thing if you cannot alter the shape with it . messi needs somebody in front of him and or he just gets disinterested just as he was against real in the copa del ray and when he had clearly stated playing villa benefits him or even cesc under gaurdiola . villanova needs to be a bit more flexible and play players in their favourite ( this word is correct i dont know why it is being underlined for being wrongly spelled ) positions rather than just being too tactical . Barcelona’s philosophy of football is persistent throughout their entire team, and youth setup, but it has cost them dearly. They pick the entire team on basis of technical ability. And in some positions, that doesn’t matter as much as height or strength. They can keep the technical masterminds to midfield and perhaps attack, but they need to let defenders be defenders. God knows how many young boys they missed out on, because they had issues with ball control, but could have been effective defenders or target men. Barcelona’s philosophy cost them dearly? Like 14 titles in 4 years? I don’t get your point. They don’t need to change their philosophy but to evolve it pragmatically and to get it right again. ZM emphasizes the lack of physical strength. That certainly was important yesterday. But Barca was able to deal with that in the past. The difference is movement. With and without the ball. When they trashed Real Madrid 5-0 in what was the best performance I’ve ever seen in football, there was constant movement of several players, one-touch football at mind-blowing speed. Wherever the ball was on the Pitch, Barca just had superiority through better positioning and faster passing. If Barca does this again, they can still trash any side. Incluiding this great Bayern of yesterday. No, not including the side of yesterday. Why was Bayern’s physicality so overwhelming? It’s not that Barca were sick, it’s that Bayern’s implementation of counter-pressing and pressing exacerbated the inferiority of Barca’s physicality. This is something that wasn’t so big before because sides didn’t use these techniques that demanded such work against Barca, and Barca used to have more aerobically fit players. Xavi in particular has declined horribly this year because he no longer runs like a box-to-box midfielder anymore. tiki taka is not dead. and to win the champions league a team will have to be capable to draw the new holy three on the pitch. I thought there was a bit of a pttern to the Bayern pressing, and something the wet centre of the pitch helped them in. 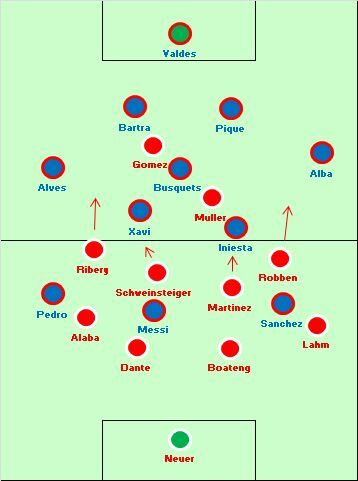 Facing Gomez and Muller, Schweinsteiger pressing forwards and either one of Ribery or Robben coming centrally, Barca either had to have Busquests or Xavi attempt tough dribbles to get out or play a simple ball to the flanks. And this is where, I felt, Bayern pounced. The relevant winger stayed tight to the opposing Barca full-back, his own full-back pressed up alongside the Barca winger who was coming short, one of the Bayern holding midfielders and one of Gomez or Muller then blocked the easy pass back to the centre. The amount of time Barca and Bayern contested for throw ins and the general scrapiness of this contest means that Barca weren’t able to get any meaningful passing rhythm. Of course, if they managed to go through this phase and get the ball back into the centre of midfield, now less crowded, then Bayern quickly retreated. LOL Pique good in the air? Pique is tall but he is not good in the air. Varane and Ronaldo proved that this season and he is taller than both of them. If Barcelona had signed Joey Barton a couple years ago for free, this would never have happened. He would have brought proper English grit to this team, and his Spanish is awesome too. Munich resemble a rugby team rather than a football team! They are a bunch of 7` hammer throwers, and little more.. Add in a compliant referee and viola! At the very highest level of club football my expectations are higher than what the numpty Hungarian referee showed last night, a homer if there ever was one..
I’ll credit Munich for their defensive qualities, but less so than Celtic who largely delivered the same defensive game against a fully fit and in form Messi for a tenth of the Germans financial outlay! Equally, their 4th goal was the move and thee goal of the game, that aside they are a god awful ugly team of physical fouling referee assisted cloggers! One off side goal, another should not have stood due to Mullers lack of class inside the box on Alba.. Good help us all if Munich represent European footballs benchmark, if Chelsea weren’t bad enough, we now have uber rugby, rather than the beautiful game! The unfortunate reality is that football being an athletic contest, the odds are always in favour of the more physically capable. Technique and artistry have to fight twice as hard for results. That’s why most coaches (Mourinho being the example for this age) opt to build their team around physical play – why fight against the odds? I, like you, love football only for its artistry. It’s the only reason some of us support Barca today – because they represent skill on the ball, technique, artistry, versus the majority of the world of football, which for decades has been rushing headlong to the lowest common denominator of bigger, stronger, faster. And that’s why we are so critical of Barca, because what’s at stake is not just Barca, but the beautiful game! BTW, don’t be too hard on Bayern. I wouldn’t pay to watch them play, but they do have Ribery. 1. Bayern add power to a technically very very good team. They are not a rugby team. Laughable. 2. Barca too rely on their physical ability as much as anyone else- except here the ability involved is stamina and focus-they had supernatural energy levels for pressing at their best. Their distance covered stats seem to have been falling for the past 2 years. They have been unsuccessful in Europe last year and especially this year. Not a coincidence. -As you may have guesses, he is one of my favourite players to watch. 4. Again, as lovers of artistry, compare Barca’s midfield talent (Busquets, Xavi, Iniesta, Messi as an occasional #10) to 1982 Brazil (Zico, Socrates, Falcao, Cerezo). Not much in it, Barca probably shading it(I am judging only attacking skills, defensively- Busquets and their internal organisation gives Barca a huge edge). Yet ‘82 Brazil played with a grace and a nonchalance that Barca cannot match. “Artistry lovers” should see that, no? Shouldn’t they be demanding that Barca free the best collection of midfield attacking talent ever to show us true artistry? Or are they content with slow tempo control and passing as a mode of defence? Heaven forbid that a sport become an athletic contest! Give me Dortmund`s beautiful football over Munich’s Rugby any day of the week! you like synchronizing swimming, do you ? Only when it’s you and your momma in the pool.. Hahahaha.. #munich rugby lovers lol..
1. Barça had Eto’o-Messi-Henry ====> we have Pedro-Messi-Sanchez, that is a serious decline in quality upfront. 2. Barça had Abidal (2010)-Pique(2010)-Puyol(2010)- Alvez, we have now Alba-Pique-Bartra-Alvez, another huge drop in form and quality. Barça had players like Chygrinski, Zlatan Ibra, Affelay, Hleb,Masheano,Song, etc… Some of them are good players, but they were not necessary. talk about mismanagement. Tiago Silva, Aguero, Falcao etc… are the level of players any top team that wants to compete with Real, Bayern, etc… needs to have. Bayern should enjoy this round because it is predetermined that Madrid will win and Bayern will not be receiving any extra assistance from the referees in the final, nt will Dortmund get any offside goals in the next two games. Everything in Europe is bought and sold and it is coming to resemble the WWE. I found it interesting, most noticeably towards the start of the game, that it was Gomez who stuck tight to Busquets rather than Muller. Muller was often the highest presser up the pitch with Gomez behind him. This meant that Bayern didn’t suffer from Gomez’ lack of mobility (in contrast with Mandzukic) when out of possession. Instead, he could act as a fairly immobile blocker on Busquets, while the more energetic Muller was ‘free’ to cover more ground and cut off more passing angles from Barca’s centre backs into midfield. This serves as an example of the overall difference between the sides for me – Bayern’s intelligence versus Barca’s blind faith. The most disconcerting thing about yesterday’s game was Tito’s passivity. As soon as they went down 2 – nil, an urgent substitution was required especially in the midfield and reorganization of their formation. I would have replaced Pedro and Sanchez with Thiago and Villa and switched to a 4-5-1 formation with Messi/Villa at the tip. Alba and Alves will be expected to join the attack occasionally but more so with Alba. With Batra in the backline, it was necessary to ensure two vastly experienced defenders remained with him at all times. Keep the scoreline the same (2 – 0) and in the final 20 minutes, Song/Cesc to clog up the midfield further. Damage limitation. What on earth was Tito thinking?! Never mind the tactics if there is no decent referee on the pitch. Second and third goals clearly should dismissed. Second was offside and third was made after foul. I think there is an obvious pattern in this years Champions League. Barça vs. PSG games had two offside goals and now this. And do I have to mention Malaga – Dortmund game’s “too much extra time” episode. Let’s see what happens tonight Dortmund vs Real game. I really hope that referee knows what he is doing. If a player not named Messi(Iniesta, too) is unfit then Barca are okay. If a player named Messi is unfit then Barca are in trouble. He couldn’t do much yesterday and Villa and Cesc could have contributed. I know the manager has no confidence in Song (think Hleb, Ibra, Chygrnyskiy) but he could have been useful. In Messi’s absence, a diamond formation with Song or Busquets at bottom and Iniesta on top and Pedro and Villa playing upfront or a Christmas tree with Song, Busquets, Xavi behind Cesc and Iniesta with Villa as striker would have been nice. first of all, i had been in the stadium. so i noticed 2 points before the game: bayern came out to warm up about 15 minutes earlier. when bayern had nearly finished, barca started – maybe this is not too important, but who knows. second i watched messi. he really look bored, unfit, you name it. he tried to shot at the empty goal from the box and didnt hit the goal, 3 times in a row!!! this made me think. bayern won deservedly, BUT for all what was said before the game and the praises for bayerns “possession play” they just like ANY OTHERS BEFORE WERE REACTIVE. the game, the whole footballing world was waiting for: 2 proactive side against each other, maybe the first real test, whether barca can be beaten with their own game, did NOT EXIST. i expected something like arsenal in 2010 and 2011, but bayern didnt do it. i could clealy see from the stands, bayern were sitting deep from the beginning, heynckes always stood up and wanted his men to move up. one must really recognize this point, bayern scored early against arsenal and juve. they never had to come back, in the return leg against arsenal they lost! and this pattern was the same here. although barcelona was not really a threat in the FIRST half, they controlled the game and bayern only had the robben attempt in the 2nd minute and header for the goal. from open play, bayern was not really a threat, hence again they took the lead. just after halftime barcelona conceded the second – that must have been a fatal blow to the players. after that, one thing led to another. they had to shift gears, and once again got caught on the break. to me it was a chain of multiple factors + bayern did excelently what they had to do. some said 4:0 is a bit harsh and that is my point. you can compare it a bit with milan, they won 2:0, but they only had 2 or 3 chances and the first goal was really unlucky, after the free kick deflection. 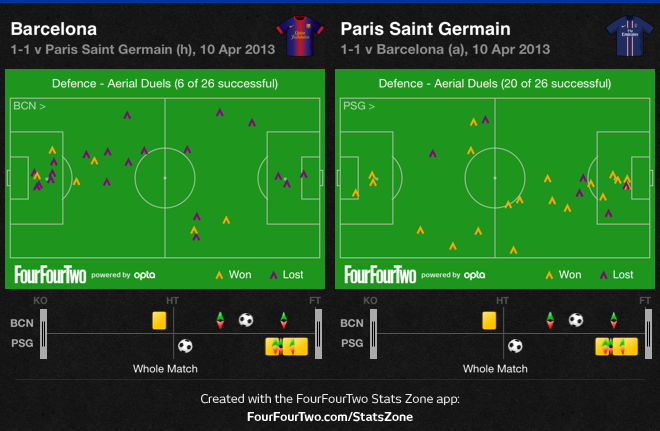 credit to bayern, but against PSG barcelona did quite ok in defending setpieces + ibra. rarely a side scores 2 times in one game from corners, where you can of course discuss the ref decisions. to me it was another example that sometimes, games can take different ways, which are not only influcenced by tactics. i dont think bayern would have won by 4 if not gomez scored the second so early. hence barcelona are on a turning point now. there were many complicated things going on, transfers, abidal and tito but if they make some decent decisions for next season, they remain the side to beat. most of the important players are stil young. it was funny to see bayern losing against chelsea, with sterile possession against one single corner, but strangely they themselves needed good defending + 2 corners this time to beat barcelona. Don’t forget that Puyol and Mascherano are out with injury. Don’t underestimate the value of Puyol in these types of games. He is a warrior and has the ability to rally the team just by being on the field. And Xavi isn’t 100% fit and neither is Messi. With these types of injuries and what seemed to be a lack of intensity it is no wonder that they lost. year and am anxious about switching to another platform. I have heard great things about blogengine. Bayern put on a brilliant defensive display, no doubt. But the major tactical error on Barça’s part was starting an unfit Messi. Bayern may have still won the game with Messi off the pitch, but it would have been a much closer match. Ideally (with a fit Messi), Barça would have started this match the way they did against Milan in the 2nd leg: with Villa (or Sanchez) playing CF to pin Bayern’s CBs, and Messi playing between the lines. What has not been mentioned about this strategy is that Messi is as important at drawing the opposition CMs (to give freedom to Barça’s midfield) as Villa is at pinning the CBs (to give space for Messi to operate between the lines). What happened here is that Messi played almost entirely level with Barça’s midfielders, outside of Bayern’s two banks. With no one drawing Schweinsteiger and Martinez in between the lines, they were free to press up onto Barça’s midfield, leaving nowhere for Barça to go except backwards or two the wings. A fit Messi would have pushed the CMs back, and allowed for more space for Xavi and Iniesta to operate. Messi’s lack of fitness had the opposite effect- it invited pressure on Barça’s midfield. A key to Barça defending is losing the ball far up the field, which also lowers the number of set plays allowed to a tall and physical opposition. That Bayern won so many corners can be largely attributed to Barça’s inability to keep the ball in the opponent’s half, which is largely due to the unfit Messi playing way deeper than usual. Once the mistake of starting Messi was made, it is indeed shocking that Tito Vilanova made no adjustments. The strategy at the Allianz should have been to keep the score close, and grab a a goal, if possible. It was never going to be an easy game, but starting Messi was an invitation to Bayern to press up the field and keep Barça on their heels all game. Tito, grow up. Champions League football demands less obvious heroism. Your…… schoolboy tactics are redundant. What have they achieved? Failing to prevent losing 4 goals in semi-final is your only triumph. Everything you post is worth a handful of cattle dung. Grow up boy. Funny, explain me how using Messi only is only good to the team. Tito ’s tactics do not show any maturity, that’s why he become the first coach to lose 4-0 in semi final. And you flames me here, cool. Your style is really unique compared to other people I’ve read stuff from. Many thanks for posting when you’ve got the opportunity, Guess I’ll just book mark this page. Pep knew this was going to happen. He saw the symptoms and warned the president. Pique, Cesc among others were not focused enough. It was happening the same thing as with the Ronaldinho’s team decline. And of course, Tito ain’t no Pep. The way Pep studied the rivals, the way he continuosly innovated year after year, the level of discipline and drive he imposed… Some players said when starting this season that they felt relieved, and we see why right now. The pressure, the positioning, the tempo control, etc all have been thrown away. Pep saw that a mini revolution was needed in order to keep everything the same, but the club did not support him. Either Barca sell a bunch of players (Pique, Alves, Cesc, Villa, Pedro, etc.) and get a real coach or we will see the best team ever humiliated many more times. Maybe Oscar Garcia (Maccabi Tel Aviv) could be the man to lead the next generation with Thiago, Montoya, Bartra, Tello and Deulofeu instead of the above players. RelentlessMTG Magic the Gathering card store offers FREE SHIPPING on U.S. orders of $50 or more.